Appellation or Vine Rossese di Dolceacqua D.O.C. Elegant red wine with good structure, made from the native rossese variety. Its scarlet colouring becomes deeper on ageing, when its vinous, fruity nose also takes on greater intensity and hints of wild berries. 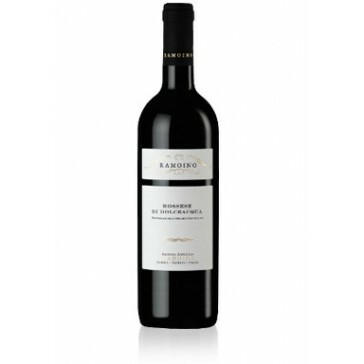 Dry, luscious taste with slight tannins showing, becoming softer, longer and smoother over time. Third generation growers, the Ramoino wine farm is located in Sarola, near Imperia, at the heart of the Riviera dei Fiori (flowers coast) in Liguria. The white wines are made here, in the main climate-controlled winery built underground, where the ageing in wood, bottling and bottle maturing also takes place. The red rossese and ormeasco wines, on the other hand, are made in wineries located in their respective areas of production. The vineyards are to be found in the areas of Dolceacqua and Camporosso (rossese), and Sarola, Borgomaro, Albenga, Diano Castello and Bordighera (pigato and vermentino). All the vineyards are on terraced hillsides, and grass regeneration is practiced. Guyot pruning is used for the whites, while the recently-planted reds are trained using the cordon method, and the older rossese, planted between 1920 and 1946, are bush vines. Roasts with not too rich a sauce, medium mature cheeses. Best served at a temperature of 18-20°C in medium-bowled clear glasses. Stored horizontally in a cool, dry place it will maintain its special qualities for more than 3-4 years following the harvest. The rossese dolceaqua Ramoino 2015 is one of our favorites. This wine is pure, full of fruit and smooth. We give this wine to friends as a present and everybody likes it.